Who is behind turmoil in Libya? “So I came back to see him (a General at the Petagon) a few weeks later, and by that time we were bombing in Afghanistan. I said, “Are we still going to war with Iraq?” And he said, “Oh, it’s worse than that.” He reached over on his desk. He picked up a piece of paper. And he said, “I just got this down from upstairs”—meaning the Secretary of Defense’s office—”today.” And he said, “This is a memo that describes how we’re going to take out seven countries in five years, starting with Iraq, and then Syria, Lebanon, Libya, Somalia, Sudan and, finishing off, Iran.” I said, “Is it classified?” He said, “Yes, sir.” I said, “Well, don’t show it to me.” And I saw him a year or so ago, and I said, “You remember that?” He said, “Sir, I didn’t show you that memo! I didn’t show it to you!”, said General Wesley Clark in an interview with DemocracyNow!, March 2, 2007. Both the former Cuban leader Fidel Castro and Venezuelan senior diplamat hves blamed Washington for creating the terrible situation in Libya in order to invade and occupy the oil-rich country. “The government of the United States is not concerned at all about peace in Libya and it will not hesitate to give NATO the order to invade that rich country, perhaps in a question of hours or very short days,” Castro wrote in a column published Tuesday by Cuban state news media. The Zionist poodle, US Secretary of State, Hillary Clinton who supported Israeli bloodshed of Arabs in Lebanon (2006) and Gaza (2008-09), was quick to condemn Libyan dictator Qaddafi: “This bloodshed is completely unacceptable”. Stephen Lendman, an American writer and radio show-host – in an interview with Iranian Press TV, said: “When NATO, when an ally is being attacked, you don’t get reports in the US media, they’re suppressed. It was wall to wall Egypt when those protests were going on. It’s wall to wall Libya now with the protests going on. I smell a rat. 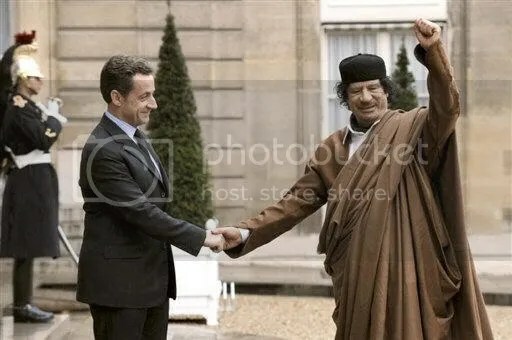 Again I despise Gaddafi. Libyans deserve much better than him. They have for many years. But I suspect that Washington is doing the pushing”. It’s interesting to note that the same American Jewish lobby groups which first supported Hosni Mubarak’s regime and later the take-over of pro-Israel military junta in Cairo – are now supporting the regime-change in Libya. The Islamic Republic of Iran has thrown its support behind the pro-democracy protests and has announced its readiness to send humanitarian aid to the victims of Qaddafi’s military crackdown. Tehran has also announced that it would make every effort to determine the fate of the missing Lebanese Shia leader Imam Moussa al-Sadr, Mehmanparast concluded. Imam Moussa al-Sadr went missing during an official visit to Tripoli to meet with officials from the government of Gaddafi in August 1978. It is widely believed in Lebanon that al-Sadr, the founder of Lebanon’s Amal movement, was kidnapped by the order of senior Libyan officials. Accompanied by two of his companions, Mohammed Yaqoub and Abbas Badreddin, Sadr was scheduled to meet with Libyan officials. In 2008, the Beirut government issued an arrest warrant for Qaddafi over Sadr’s disappearance.